We all like mini-pickups, right? 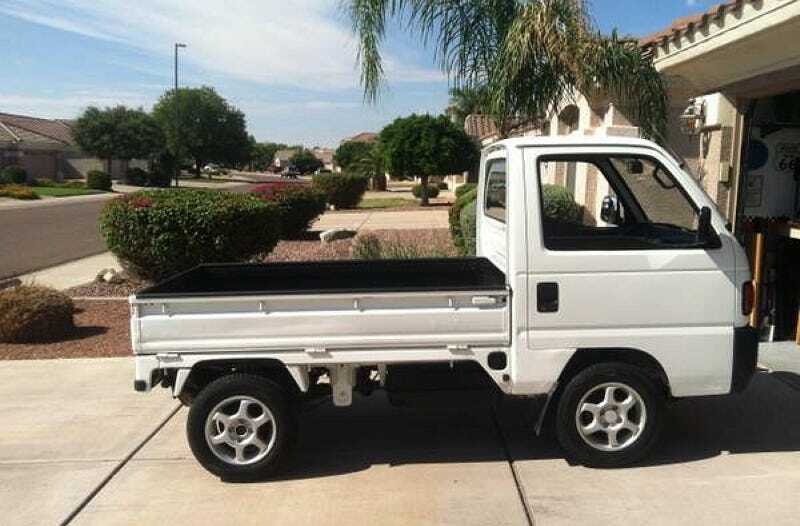 Well, today's Nice Price or Crack Pipe Honda is a mini-pickup that you and a couple of friends could literally pick up. We'll see if its price makes it a truck that you might also actually want to, you know, pick up. Have you seen any of these TV shows like Flipping the Block where people try to game the real estate market and make a fortune? The current owner of yesterday's Bedford 4-ton Response Vehicle seems to be attempting to do the same thing in the rare heavy truck market, seeing as the price has nearly doubled since its last sale back in February. Unfortunately, 58% of you flipped out over that mark up, and it went down in a Crack Pipe loss, our second of the week. Maybe if we went with something a wee bit smaller - both in price and physical size - things would turn out differently, what do you say? Here we have a 1995 Honda Acty pickup truck, which is about as small as you can go without there being Hot Wheels embossed on the bottom. It's also so cute that you might suffer uncontrollable urges to hug it and only address it using baby talk. The Acty never officially made it here to the land of free and home of the brave. It's a little bit too small to pass our stringent safety standards, and compromised by U.S. emissions standards its 656-cc E07A triple would have seen many of its already meager 44-horses stampede out of the corral. This isn't a totally dirty bird as by the time it was built even commercial vehicles in Japan had to meet that country's smog standards. The rest of the drivetrain is made up by a 5-speed manual transmission and full-time four-wheel drive. The ad claims 78,000 kilometers on the clock, which of course doesn't count those covered by the trip across the Pacific when this was brought over from Japan. Other notable features include working A/C - which must require a choice between being cool and going up hills - and fold-down sides on its Chiclets-box of a bed. That bed has recently received a fresh coat of bed liner, and the ad says that new tires wrap around custom alloys sourced from Italy. Also, Yosemite Sam! Perhaps most importantly, the ad also says that the tiny truck has a clean title and is tagged in Arizona for street use. Considering that the top speed is about 60, you might want to limit it to the streets, staying off the highways and byways. Still, you can get pretty much anywhere without ever hitting an onramp, and it's now time to hit up this Honda and decide about its price. The seller is asking $6,000 for the cute little Ute, and it's safe to say that it's a rare opportunity to find one here at any price. What's your take on that $6,000 for this Acty, does that seem like a small price to pay for so small a truck? Or, despite its size, do you think there's room for negotiation? H/T to Sideburns for the hookup!